For some people it is important to recognize any signs, while others feel this is a bit unrealistic and foolish. Even sometimes logical people have a part of them which does pick up on little signs they witness around them, and so they don’t like just ignore these signals. 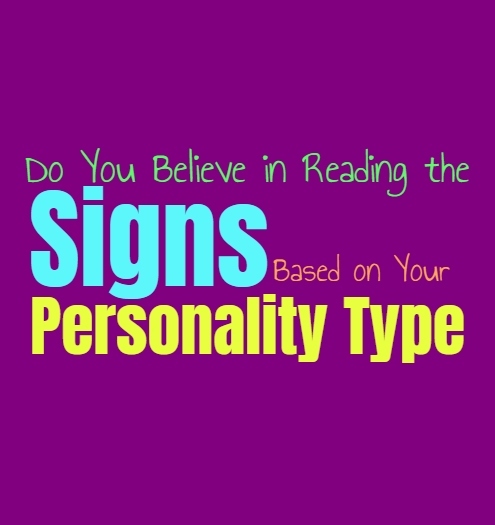 Here is how much you believe in signs, based on your personality type. INFJs are often focused on being logical and realistic, but at the same time they possess a more complex side to them than just this. INFJs are considered paradoxes because they tend to be drawn in different directions, to both the logical and the spiritual. They are intuitive people who do believe in recognizing signs, especially when it feels rather obvious to them. If the signs they witness truly reach the INFJ on a deeper level, they will certainly want to respect this and listen to what they are seeing. ENFJs try to be rational people and they do want to find a way to be efficient. While they can be rather focused on following the truth and proven methods, that doesn’t mean they don’t have a spiritual side. ENFJs do have a tendency to follow certain signs, especially when these signs truly speak to the ENFJ. They have strong intuition and sometimes this can cause them to follow little signs they witness, even though other people might not completely understand it. ENFJs are both logical and spiritual people, and sometimes these things contradict one another. INFPs usually do believe in following the signs, especially when it is something which connects to them deeply. They go after what feels right and believe in always following their hearts. Sometimes it might seem foolish to others but the INFP knows what they believe in and they aren’t afraid of seeming foolish. Sometimes for them the sign is more of a symbol than anything else, just the nudge they need to push them in the direction they most want to go. ENFPs do often believe in following the signs when they feel personally connected to what they see. They often read signs in little things but might not always let others know this. ENFPs focus on following their passions and doing what feels right for them, even when it feels a bit odd to those around them. ENFPs care about being sincere and always going after what they want, even when this means reading into the signs that no one else can really see. INTJs don’t really follow things like signs, instead they follow facts and evidence. For them just believing in signs which don’t have anything backing them up, seems completely. Signs which relate to someone trying to intentional give them a signal towards something is entirely different and perfectly acceptable for INTJs. What they don’t read into is this idea that universe or some higher power is sending them signs, simply because they cannot back this up or find any true proof behind it in order to follow it. ENTJs don’t really read into signs, instead they want to focus on being efficient and following the facts. For them it feels a bit foolish to waste their time and energy trying to read into signs which they cannot prove. ENTJs are factual people who want to follow proven methods so that they can be sure they are making the right choices. For the ENTJ it is valuable to go after what they want and always be able to backup their choices and actions with some sort of evidence and direction. INTPs really enjoy being able to connect with different options, so sometimes they might read into signs more than people realize. This isn’t something they always share with people, since they don’t want to be seen as strange or lacking in logical thought. INTPs ultimately are very factual people who believe in being as logical and precise as possible. While they do their best to follow the information they uncover, that doesn’t mean they don’t like to consider reading into the signs they see. ENTPs are certainly logical people but they are far more complex than just that. They often enjoy considering different options and might go through periods of time where they want to consider reading into signs and other things. The ENTP who is diving into this side of themselves will be interesting in recognizing the signs around them, and even want to follow them just to see where it might lead. While this might not last it is certainly something they might enjoy considering for a while. ISTJs are far more interested in following things which are concrete, rather than trying to read into signs. ISTJs want to focus on things they can prove and tangibly see and know they are true. When it comes to reading signs it feels a bit foolish and like something they cannot rely on at all. They don’t need to be open to everything, and would much rather look at the things they can prove and know will help lead them towards a more efficient life. ESTJs focus on efficiency and following what they know to be proven true. They want to enlist methods which are completely solid, and so they believe in focusing on facts. For the ESTJ reading into signs can feel a bit foolish and lacks a sense of clear direction. For them it is draining to be around people who cannot simply follow the more concrete evidence, and instead go towards things which are less factual. ISFJs do sometimes have a more spiritual side to them and might be drawn to reading the signs around them. This isn’t likely something they admit to others though, since they are also very practical people. They believe in following what they know to be accurate so that they can avoid letting anyone they love getting hurt. For the ISFJ it is important to make sure they are being efficient, but there is often a part of them which might read into the signs. ESFJs are definitely practical people and so because of this they do often focus on things they can prove. While their actions might show that they believe in efficiency, this doesn’t mean they don’t always find themselves reading the signs they feel around them. They do have many different sides of themselves and so they are usually drawn to reading into the more spiritual ends of things, including signs and intuition. ISTPs are more focused on factual and practical things and so they don’t like themselves drawn to reading the signs. They believe in things which are tangible and they can actually see proven in front of them. While ISTPs might be open to new things and ideas, most of the time reading the signs just is not for them. They look at what they can see and feel themselves, not things which lack evidence. ESTPs are more focused on things which are practical and tangible, rather than the spiritual end of things. They might have moments where they feel like they are being given a sign, but this isn’t something which they follow through with often. Most of the time ESTPs are more interested in things which they can see proven before their eyes, rather than things which require them to have more faith. ISFPs can be rather spiritual people and often believe in reading the signs. They follow their hearts wherever they might lead, and this often takes them down unexpected paths. ISFPs do often feel inspired by their more spiritual side and believe in trusting whatever their instincts show them. Sometimes this causes the ISFP to read into certain signs they see and feel around them, even if others do not understand. ESFPs do often believe in reading the signs, especially when they feel personally connected to them. THey are often spiritual people who believe in going wherever their heart might lead. This causes the ESFP to read into the signs they see and feel around them, especially if they feel personally connected to them. Sometimes this causes them to overanalyze these signs, but for the most part they just go with whatever feels right.